PawSox Heavy: He used to give his mother flowers and that. He used to give his mother flowers and that. Former Pawtucket/Portland pitcher Lincoln "Sheldon" Holdzkom has been ruled fived by the Phillies. So that was good. He wasn't in Pawtucket long enough for me to really have an opinion or attachment. But good luck and all with those guys. Also, bitchin' reliever Travis Hughes has been signed by the Yokohama BayStars to a one-year deal. Starbuck sings "Moonlight Feels Right"
Bobby Scales must find an apartment. Nobody beats a Bailey deal! 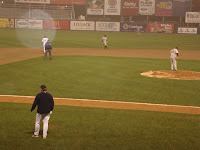 Labor Day and last PawSox game of 2007. Welcome to the Ocean State, Jon Van Every!